Portal Companion Cube Dice | OhGizmo! By David Ponce on 02/13/13 • Leave a comment! With its nearly instant popularity among geeks, we’re fairly certain you know at least one Portal fan. So if they have a birthday, or some kind of special even coming up, why not buy them a pair of Companion Cube dice? 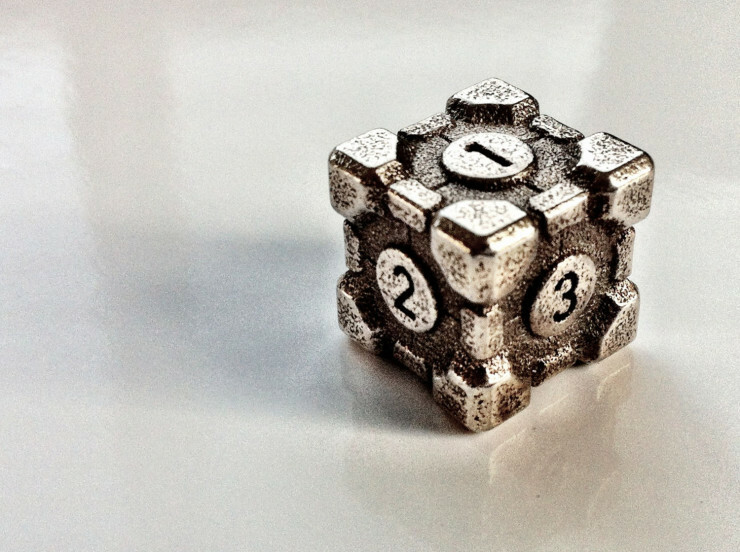 This unique die (singular dice) is made layer by layer in a 3D printer and then fired to fuse the metal particles into solid steel. It is available in a numbered version, a version with just hearts. The dice are available on an Etsy store, meaning they’re handmade in low volumes, meaning that they’re relatively expensive. One die is $29, so if you’re going to buy a pair, you’re out $60. That’s a lot for dice.